Al Nusra Front claims responsibility, that means Israel is implicated once again. Anyway when did this happen - the removal of pictures - and why? Note somebody is still photographing him! 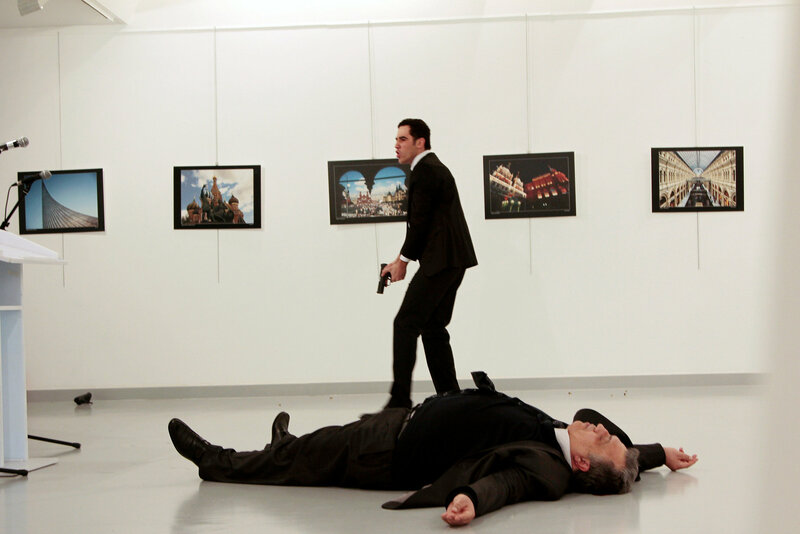 It would be quite preposterous to suggest that neither the Russian Ambassador to Turkey or his assailant died on 19th December, 2016, wouldn't it? That is why I don't propose to do so. However, bearing in mind the preposterous nature of many of the world events we have been witness to, perpetrated by Governments and their agencies, the possibility should never be absolutely excluded. In all such terrorist events or the like, it is absolutely essential to keep an open mind, indeed to treat them with a questioning scepticism. It is a first step to understanding, in a mad and dangerous world, what is actually going on. 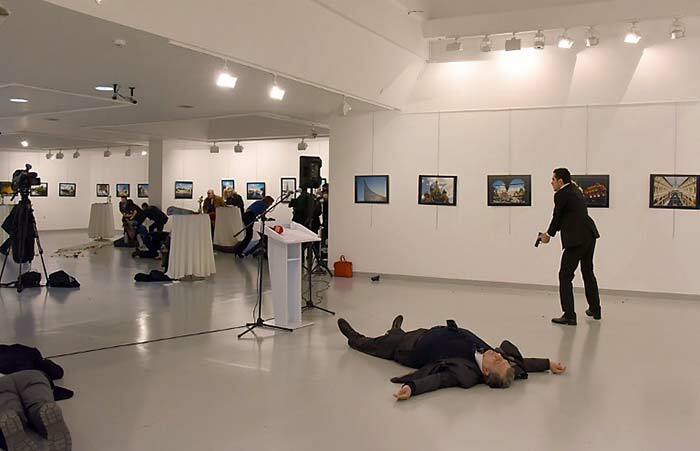 Even if everything is as it has been presented, namely that the Russian Ambassador Andrei Karlov, whilst giving an opening talk at an exhibition of Russian photography in Ankara, a well dressed young man standing behind him Mevlut Mert Altintas, reached inside his suit jacket, pulled out a pistol, and fired about eight shots into Karlov's back, killing him immediately. So conventional wisdom suggests this is a Jehadist or a man with Jihadist sympathies, who Blames the Russian and Syrian Governments for recent attacks and advances in East Aleppo in particular. This is certainly how President Putin interpreted it for he was quoted as saying, "There can be only one answer to this - stepping up the fight against terrorism, and the bandits will feel this.” Both in east and west, domestic terrorism results in ostensibly identical reaction: the need to take military action against Muslim extremists - i.e. ISIS or whatever the preferred name is. However as everyone must now realise, east and west though pretending to the same objective, are in fact pursuing quite different ones. 'ISIS' is merely a political expedient for essentially two power blocks fighting for political hegemony, whilst denying it is doing so. It is a deceit projected onto a gullible public by the political class in which there is nothing to choose between east and west for integrity, or lack of it. Neither side has genuine concern for the non-combatant civilians caught up in all. They are pawns in the PR game or the 'collateral damage' of hostilities. That Altintas merely fits into this wider picture - just one individual making his own protest and sacrificing his own life in the process - is understandable except for one problem: he has no obvious connection to radicalism, Islamic or otherwise. His family have no pretensions it and he has only recently undergone police training having qualified only two years before, when if he had, it might have expected to have been noticed. As far as we know he had no direct familial or other link to Aleppo itself. Perhaps his motivation came more from a hatred of Russia? It is certainly clear he made no attempt to shoot at or injure anyone else in the room, that might support such a contention. He appears to have resigned himself to death and makes no attempt to flee or surrender peacefully, although he could not have had many more bullets left unless he had a replacement magazine. So to summarise he appears to be a very unlikely assassin. Was he there as an official body guard or police detachment. Apparently not. So what of the Russian Ambassador's security detail. Given the tense relationship between the two nations and the recent level of terrorism both in Turkey and region - the recent Coup is still fresh in the mind for goodness sake - the absence of security is quite amazing, indeed highly suspicious as was the timing. It happened only a day before the leaders of Turkey, Russia and Iran were due to meet to discuss Syria. Any action of this sort might be expected to sour relations between the first two, and further point to western agencies that view with concern the growing cooperation between the three. So in addition to working for extremist Muslim groups, another body of opinion might suggest he was actually working for western interests, by which we mean NATO/CIA/Mossad being the most likely. But a further possibility that should not be excluded is a joint Russian/Turkish operation in order to pin the blame on precisely those western interests and conversely cement the tripartite relationship referred to. If this were the case a theatrical ruse becomes more of a possibility, in which the two main characters act the part. There is also the possibility that although Karlov might have been unharmed and rescued, his attacker was double-crossed and eliminated contrary to the assurances given to him. Very strangely that very night Putin was due to attend the theatre to see the play 'Woe from Wit'. It was written by the poet and diplomat Alexander Griboyedov, who was himself murdered by a mob when ambassador to Tehran in 1829. Karlov was in fact the first high level diplomat to be assassinated abroad since Griboyedov! The Guardian calls it a 'bizarre coincidence'. I rather take the view that there are no such things as coincidences when it comes to international terror events and even some non-terror ones! Of course Russia has now suffered the tragedy of the the Tu-154 plane which crashed into the Black sea with the loss of 92 people on board, including members of a famed army choir. It had departed from the southern Russian city of Adler on Christmas Day morning (25.12.16) and was heading towards Latakia in Syria. So now let us take a closer look at the precise events for anything that might suggest the untoward, defies logic or common sense or is otherwise a divergence from the officially approved version. First it certainly looks staged. The first question is, are both Ambassador and assassin really dead? As usual what is not shown is as important as what is. We don't see Mevlut Mert Altintas being challenged and shot dead, or Andrei Karlov removed it should be noted. The one photo of the dead Altinas, certainly looks realistic with footprints in the blood although its harder to see how the blood got there as there is no corresponding blood staining on the clothes that could account for it. Nor do the wounds to the abdomen and chest equate with the pit marks in the wall, none of which are higher than his thigh at least. The official explanation made a point of the fact that the assault troops or police aimed for his legs. This could explain both blood on floor and low bullet holes, but it's highly unlikely. What trained team in the circumstances ever aim for the legs? Another couple of points: there is a photo of him brandishing his weapon outside the room in the staircase area of the building. 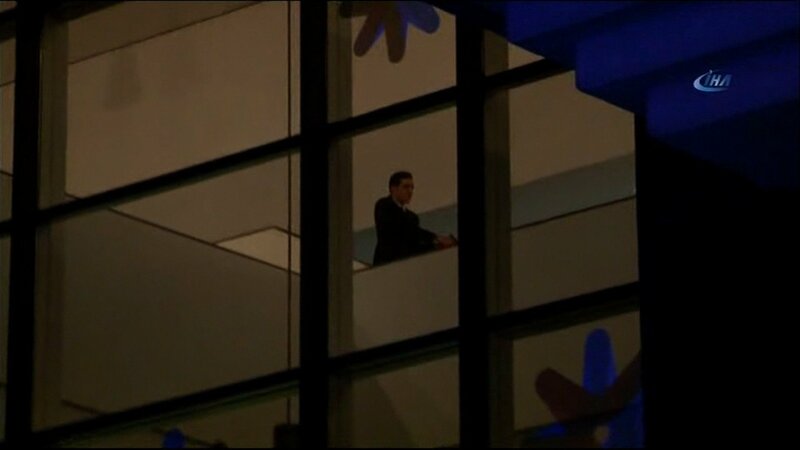 So he must have allowed all the observers to leave and then followed them outside, so why did he return to the room to be shot back in the same location? The photo certainly leads you to believe he didn't leave the room doesn't it? The second point is that the image of him lying on the floor certainly suggest a growth of beard (not seen in the above but may be viewed at 11.45 into video here: https://www.youtube.com/watch?v=6LjLD1lXf2w) that is not apparent ostensibly only moments before. This also is hard to explain. One more observation regarding Altintas. If you check out his trouser length in the shooting scene, it may be observed how long they are, buckling at the ankles where they meet his shoes. Now compare this to where he is lying on his back, apparently deceased. Somewhere along the line, and there may be a perfectly rational explanation for it, I don't know. For some reason what appears to be the magazine of his gun lies by his side but there is no appearance of the gun which might have been expected to remain in his right hand. Where is it and what happened to it? How was Altintas able to move about the building yet ends up shot dead where he first stood? The same surviving man (the interpreter?) is seen next to the Ambassador's widow. Shown again here from a different angle. Who are the Eastern Republic looking gentlemen talking to the partly hidden assassin in background? They are not seen in later images. As to the shooting itself, it is hard to believe, given the current situation in Turkey and area to the south, the Russian Ambassador would ever be allowed out without a competent body guard. Would his safety and security ever been entrusted to just one Turkish policeman who had only been qualified for two years? 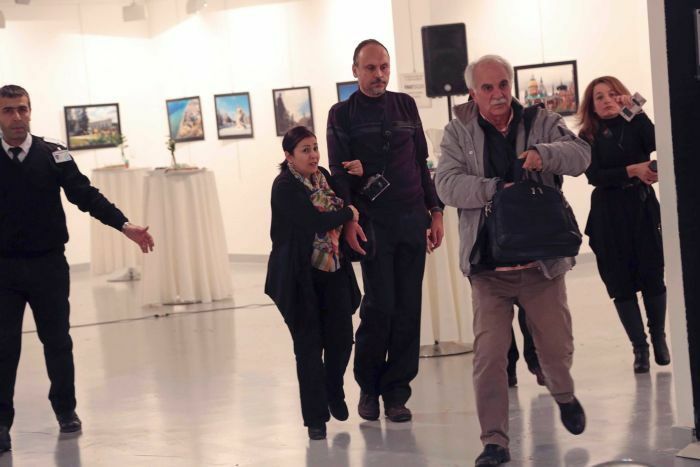 Where is Russian security, or even Turkish, to return fire as soon as Altinas starts shooting? Nowhere clearly. There is just a glimpse of a man lying prone to Karlov's left. Was he also hit or is he just taking avoiding action. If hit why have we heard nothing about him? He was certainly in the line of fire. Altinas appears very calm and considered and any sign of nerves prior to the attack, other than flexing his right hand, feeling inside the left breast of his suit (presumably to check on his weapon) and rubbing his nose with his left hand, appear absent. He wanders a little during the introductory speeches. I wonder if his location and behaviour might be expected of a policeman on protective assignment, much more likely to take a low profile out of the limelight. Or had he been just allowed in on the back of his identity card? If so what sort of security is that? The shots when he fires seem real enough, and there is evidence of the empty cartridges where they might be expected on the floor to his right (see image above) but the way Karlov falls backwards rather than forwards (after all up to eight bullets into the back must provide additional forward/sideways kinetic energy to a body with an anterior centre of gravity), the fact there is no sign of blood or bleeding, and the fact there is apparently no twitching of the body or any form of sound - a moan or groan - makes it highly theatrical and suspicious. There appears to be no head wound so it is highly unusual for body shots in such a large man to cause instantaneous death without any final signs of expiration. This is not easily explained. Now I would draw your attention to the rather strange and inexplicable issue of camera shots and positions. You will see that there are at least five or six angles covered. The one above from the left hand side of the room. The one from the RH side below. This you will see is from a different angle from the one, two above, which appears to be taken from a very low angle close to the floor. It could be explained by two cameras or one on the move. Then there is a central position (above) and two more further back looking towards the shooter (three below) and another in the opposite direction of the cowering observers (see two below) Note also that the one above appears to be just a chopped close-up of the wider angle three above. Now here's the rub! It is hard to explain where these angle views originate as there is no sign of anyone in these positions. There may be a glipse of a camera off to the right but nothing can explain where the detailed images when everybody is shown to be diving for cover or crouching in terror. We have to ask if the terror is real or acted? Only one woman appears to be truly terrified. (See image three below) Nor can it really be explained why there were so few at such an opening event or why there appears to be no attempt at escape. In the same room with a mad shooter why does it appear no one attempted to flee or indeed why after shooting the Ambassador he appears to make no further attempt to injure anyone. It is all just noisy protest and theatre. At some stage there is the image four below, where the audience is allowed to leave in a fairly orderly fashion as the shooter continues to perform. This also is very strange, not least that some one escaping from a gunman and extreme danger, would bother to continue photographing the scene. Note none of the cowering group or those walking out are shown to have cameras or phones in operation so who WAS taking the camera shots? Can I also ask who would actually just walk away with there back to a gunman who had just shot a man in front of them in such a way? Would not the natural reaction be to retreat from such a threat backwards, keeping eye contact until such time as reaching safety and then running like hell? Only one person appears truly afraid. Who are these people walking away in orderly fashion with their backs to a rampaging gunman? Work this one out! Where is the shooter whilst this is happening? Also the fact that an aspirator appears to be attached and he is being dealt with as a living person rather than a corpse which would likely be fully covered is worthy of note, is it not? 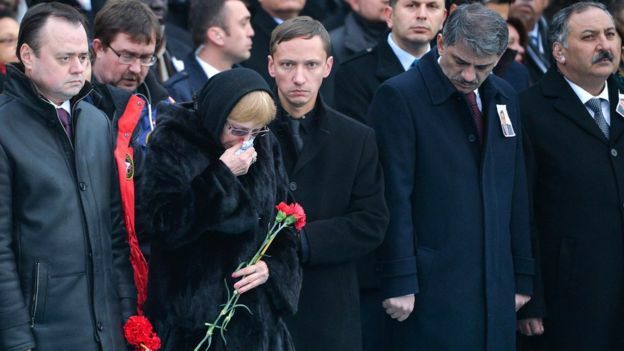 Now a few observations regarding the coffin with the body of Karlov inside it. Is it my imagination or does it fail to suggest the dead weight of a very large and heavy man? Note the photograph below and video here: https://www.youtube.com/watch?v=AwaGp0GPMXg Perhaps the pall bearers were super strong and were super strong and used to this far from easy activity? Back in Russia. 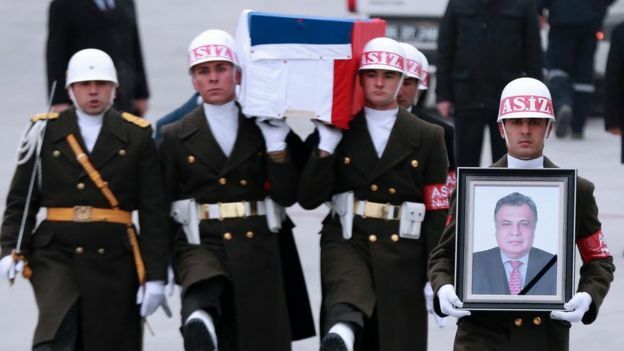 Now eight pall bearers to Turkey's six. It certainly appears to be the same casket - note the treatment of the flag treatment at the front. Without doubting the reality of the official version of events, as always the circumstances certainly raise many strange and unanswered questions. If it was a fake it was a very complicated and convincing one, that would have to include all the ceremony surrounding a counterfeit mannakin. This is step too far for even a sceptic like me. There is however the possibility that the noise and shock might have precipitated a death from natural causes, as the apparent absence of chest wounds is otherwise hard to explain. Nor is it impossible that there are other explanations for the death of the assassin. If not theatrical con. (as some think) a NATO Gladio-style false flag? "Furthermore, World Zionism is using the assassination of Karlov to cover up the bombshell dropped earlier by Syrian Ambassador To the UN Dr. Bashar al-Jaafari that 14 intelligence officers from Turkey, the US, the usurping Zionist tumor, Morocco, Qatar, Jordan and Saudi Arabia are stuck in Eastern Aleppo, a crippling blow to the #FakeNews narrative across corporate and social media spheres about “massacred civilians” and “genocide” and “indigenous Syrian freedom fighters”. Instead of this enormous revelation making the rounds across televisions, radio stations, newspapers and websites globe-wide, all the focus is on Karlov. World Zionism is still in panic mode. It cannot cope with the reality at hand, that Aleppo is free and the conspiracy against Syria is as dead as the New Middle East project was after Hizbullah beat ‘Israel’ to a pulp in the 2006 July War"
"For the record, it should be documented that the conclusions reached here are being echoed in Russia. Vladimir Zhirinovsky, the head of the Liberal Democratic Party of Russia, outright called Karlov’s killing “a false flag operation by the West”. Frantz Klintsevich, the deputy chairman of the upper chamber of the Russian Parliament’s Defense and Security Committee, called the assassination a “true provocation” and a “planned action”. Most certainly. And going deeper, what Karlov’s killing really feels like is Gladio. 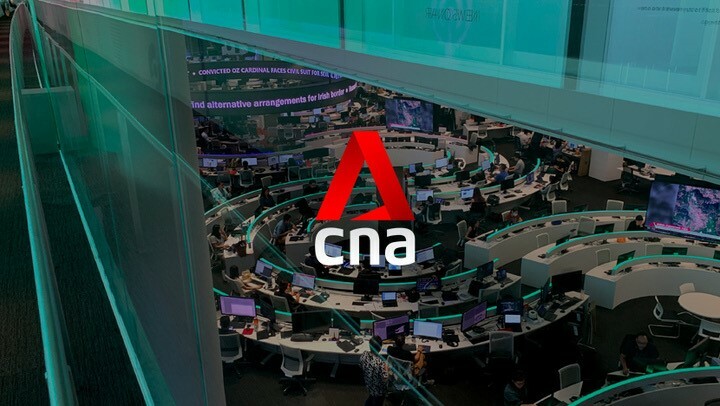 For four decades, NATO intelligence services, most prominently the CIA and MI6, ran secret armies in over a dozen European countries and utilized them in false flag operations and anti-democratic actions across the continent. This included everything from bombings to government ousters, assassinations to guerrilla warfare and sabotage."